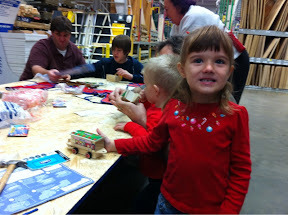 This Saturday Alyce and I went back to Lowe's to complete another section of train. This week we got to complete the center / passenger car of the train. Alyce didn't seem as interested in this car as last weeks car but her hammering skills were much improved. She was able to finish more nails than last time. Of course she was most interested in putting in the stickers. Alyce was very proud of her creation as she and Gideon were carrying their cars around the store. Keeping people in the store post craft is the reason why they do it in the first place. 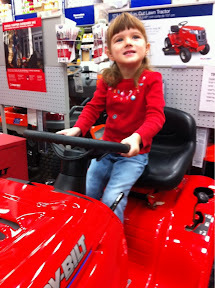 If Alyce had her way we would have come hone with a new riding tractor. 0 comments on "Middle Train"